Robert Paarlberg, author of Food Politics: What Everyone Needs to Know, is a leading authority on food policy, and one of the most prominent scholars writing on agricultural issues today. He is B.F. Johnson Professor of Political Science at Wellesley College and Associate at the Weatherhead Center for International Affairs, Harvard University. Soon after his “Attention Whole Foods Shoppers” article in the May/June 2010 issue of Foreign Policy, Paarlberg was asked to testify in front of the House Committee on Agriculture. Below, he shares his thoughts on this invitation. Read an excerpt from his book here. When you write a book, you never quite know who will get in touch. 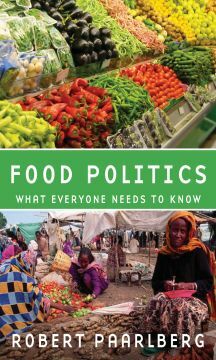 In the case of my Oxford book published last month titled, Food Politics: What Everyone Needs to Know, the last thing I expected was an invitation to speak about the book from the Agriculture Committee of the U.S. House of Representatives. Having accepted this invitation, I am now scheduled to testify on Thursday, May 13. When the farm bill leaves the committees and reaches the floor, another classic legislative mechanism pushes it toward enactment: vote trading. Farm district members implicitly or explicitly promise support on multiple measures of future interest to urban and suburban members, in return for their single “aye” vote on the farm bill once every five years. These trades always bring in enough non-farm support to insure a majority. . . . . [Consider] the astonishing outcome of the 2008 farm bill debate, which took place at a time when America’s farmers were enjoying unprecedented prosperity thanks to the highest market prices for farm commodities seen in more than three decades. Net farm income in 2008 reached $89 billion, 40 percent above the average of the previous ten years. Yet without any sense of irony or shame, the farm lobby asserted that America’s farmers were facing “emergencies” of various kinds and needed new “safety nets” for protection. The new measure pushed through was an Average Crop Revenue Election (ACRE) program that cleverly used the high income levels of 2008 as a baseline from which farmers would be able to make claims for added compensation in the event prices subsequently fell, which of course they soon did. The 2008 bill also included new funding for nutrition programs, research on organic agriculture and specialty crops, conservation measures, and block grants to promote horticultural products. There was something for everybody, making passage over the president’s veto a certainty. So, having called the House Agriculture Committee members log-rollers, I am now being called out to offer an opinion on how the next farm bill should be written, in 2012. I’m impressed by the Committee’s hospitality toward its critics. When Oxford learned about my Kamikaze mission, they asked if I would post this preview, and then check in after the hearing on the 13th to share my thoughts. I will. I work on Capitol Hill and have found this book to be very informative and relevant to my legislative research. Thanks, OUP Blog, for the recommendation! A Monsanto consultant (undisclosed) wrote a book with few attributions; how did a supposedly-academic press (OUP) let this slip past their editors??? Paarlberg is an apologist for current agribiz. harumph !